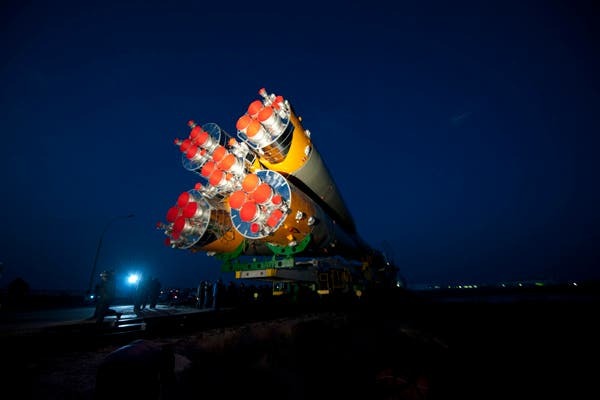 This image shows the launcher carrying the Soyuz TMA spacecraft on its way to today's launch pad at the Baikonur Cosmodrome in Kazakhstan, scheduled for 20:09 CET. The single-use Soyuz will carry NASA astronaut Catherine Coleman, Russian cosmonaut Dmitry Kondratyev and European Space Agency's Paolo Nespoli on the two-day journey to the International Space Station. Soyuz rockets will become the primary link to the space station when NASA retires the shuttle fleet next year. The name "Soyuz" comes from the Russian for "union" – a reference to the rocket's soviet design and its function of docking with other spacecraft. Nespoli spent 14 days in space on a shuttle mission in 2007 and will now begin a six month stay aboard the space station as part of the MagISStra mission – a series of over thirty experiments. Coleman is a veteran of two previous shuttle missions, logging over 500 hours. This will be Kondratyev's first flight to the Station after being replaced at the last minute for the ISS 13 mission. Nespoli will be responsible for docking two unmanned cargo craft carrying supplies to the station: the Japanese HTV transfer vehicle and Europe's Automated Transfer Vehicle (ATV). "The ATV is a fully automatic vehicle but nonetheless it needs to be monitored because as it approaches the station something could go wrong and the station could be in danger," Nespoli told ESA TV. "In that case I can push a button to send it away and we can do docking another day".